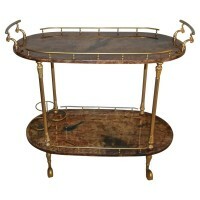 Brown stained and lacquered goatskin bar cart with gold-plated hardware by Aldo Tura. Good. Scratches and wear to lacquered surfaces including some chips and losses, green staining underneath lacquered see close ups, gilding wear to handles.